Ben Friend stretches his glass flower before tying it in a knot. 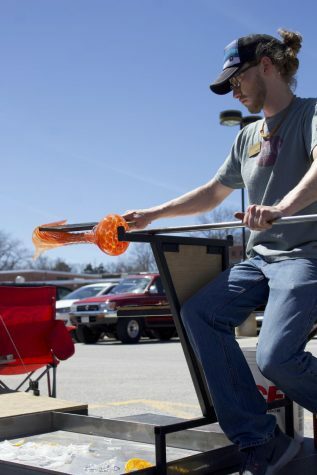 On Monday, April 8, LSE alumni Ben Friend returned to the school to demonstrate his newfound love of glass-blown art with current students in the teacher’s parking lot. Friend is now a sophomore at Hastings College, and began blowing glass art his freshman year in light of his “fascination of glass and working with the material.” Representatives of Hastings College are currently traveling around Lincoln Public Schools, as well as Omaha, to share this new program with students. 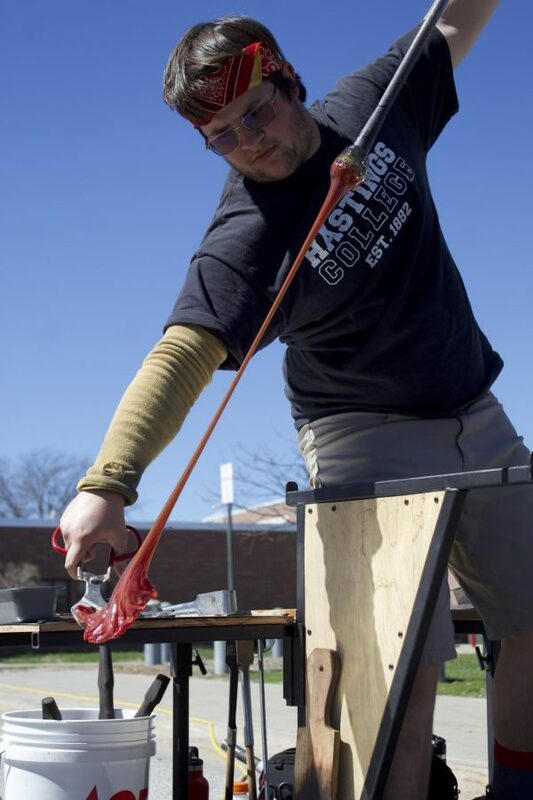 Because Southeast does not have a current class for students to create glass artwork, this new outreach aims to inspire these students with a different type of art. Friend demonstrated various glassblowing techniques while Studio Arts Instructor Michael Beahm explained the process to the students, and vice versa. Science classes also found their way out to the parking lot where they were able to learn about the science behind the extreme-heat used. Friend and Beahm made more than 12 pieces while at Southeast, and with the limited space in their trailer, they had to destroy a few to make room for new artwork. Still, the destruction of the pieces enthused the students just as much as they watched the glass break into thousands of small shards. Friend was enrolled in two Jewelry classes as well as a couple Ceramic classes during his tenure at Southeast. These classes led him to a double-major in Studio Arts and Art History, which will hopefully be followed by an artistic job. With all the fun comes difficult work that requires complete attention and patience. 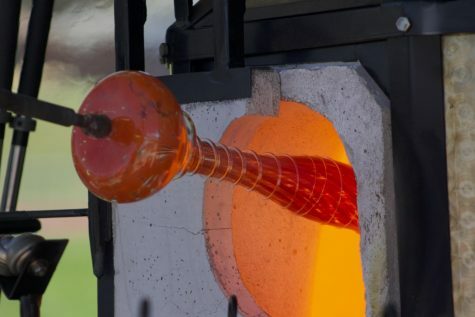 Glass-blown art is always a team effort which can take up to six hours for certain pieces. Friend himself has found himself spending an hour and a half on some. During their visit, Beahm and Friend demonstrated their dependence on each other as they needed someone gloved to grab a finished piece or transfer an object in progress. In order to safely move the glass piece to storage, a partner must wear thick, heat resistant gloves and hold the piece while the other lightly hits the pole to break the piece off. One wrong move of a partner can potentially damage an entire piece and require them to start from scratch. Beahm began his glassblowing career about nine years ago, as a junior in high school. He took a Glassblowing class through Hastings College. 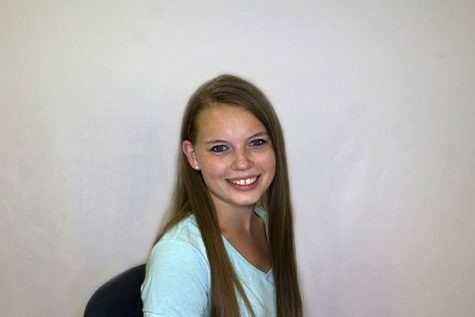 Beahm joined the new program at Hastings College during its beginning in September 2018. Beahm can be found assisting classes or maintaining the glass studio along with other studios as needed – and now, he takes the mobile class on the road. Michael Beahm heats the vase he’s working on in their traveling kiln. Michael Beahm bends back the vase to add his finishing touches. 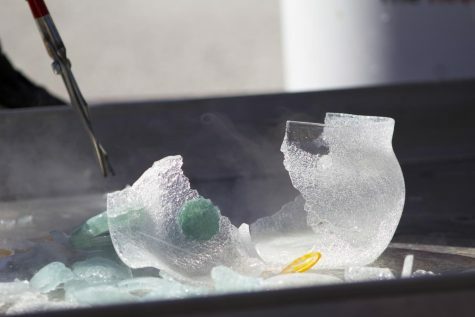 Remains of a glass piece after being cooled by water.